The highly pathogenic avian influenza H5N1 strain has spread from domestic poultry to a large number of species of free-ranging wild birds, including non-migratory birds and migratory birds that can travel thousands of kilometres each year. The regular contact and interaction between poultry and wild birds has increased the urgency of understanding wild bird diseases and the transmission mechanisms that exist between the poultry and wild bird sectors, with a particular emphasis on avian influenza. Monitoring techniques, surveillance, habitat use and migration patterns are all important aspects of wildlife and disease ecology that need to be better understood to gain insights into disease transmission between these sectors. 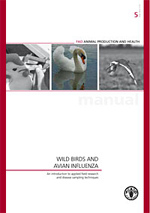 This manual contains chapters on the basic ecology of avian influenza and wild birds, capture and marking techniques (ringing, colour marking and satellite telemetry), disease sampling procedures, and field survey and monitoring procedures.